Martha’s husband Senri took me to Nagasaki today. I will leave early in the morning, so it is good to get close to the airport tonight. We had lunch on the wharf, then went to the art museum and then to the Nagasaki Bombing Museum. The bombing museum was very interesting. Not anything left in Nagasaki from the bombing, but there were some artifacts in the museum. Mostly pictures. 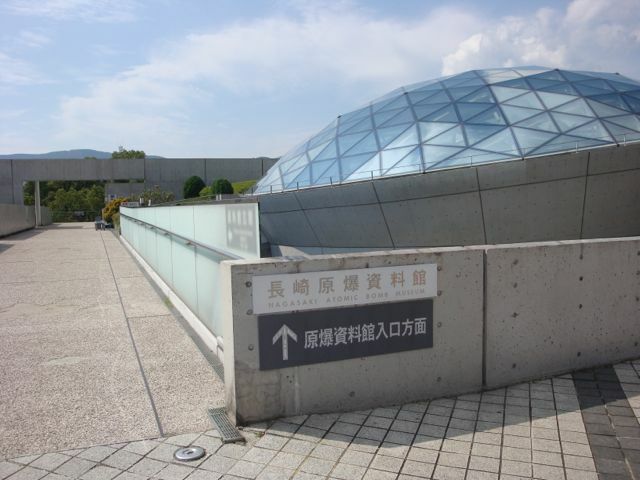 It is just a horrifying event to learn about, especially since the selection of Nagasaki appears to have been so random.The museum was swarming with school groups. I had hoped to see Yuki’s daughter, but in that crowd… no way! Then we toured Dejima, the artificial island built to keep the Portuguese and later the Dutch cooped up and apart from the Japanese people. Really a fascinating piece of history. There was an organization called the “Nagasaki International Club” that was formed to promote good relations between the internationals and the Japanese. I found it ironic that Nagasaki, the main point of international relations and the only connection to the European world at one time, was the target of the plutonium bomb.